“…The LORD gave and the LORD has taken away. Blessed be the name of the LORD” (Job 1:21 NKJV). Often cited in times of trial or difficulty, these famous words perfectly embody the attitude of Houston First Church of God during the past few months. The trials began with severe flooding in the church, which was due to the heavy rainfall and resulting damaged drainage pipe that burst in the roof above the youth room. 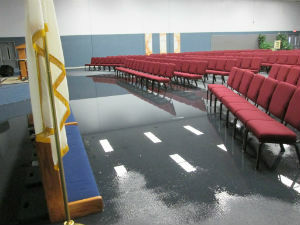 Filling the church with one to three inches of standing water, the flood damaged numerous areas of the building and required that much of it be gutted and completely redone (drywall and insulation included).